Animals come into our lives with a purpose, and that’s exactly what Simba the Trikitty did for his mom Danae. You can find many heartwarming love stories like his when you have fun with the Tripawds Random blog link in the Tripawds header menu. Have you ever noticed it? 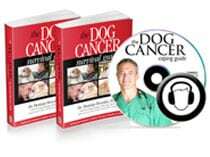 Click on our “Random blog” link for Tripawd inspawration! 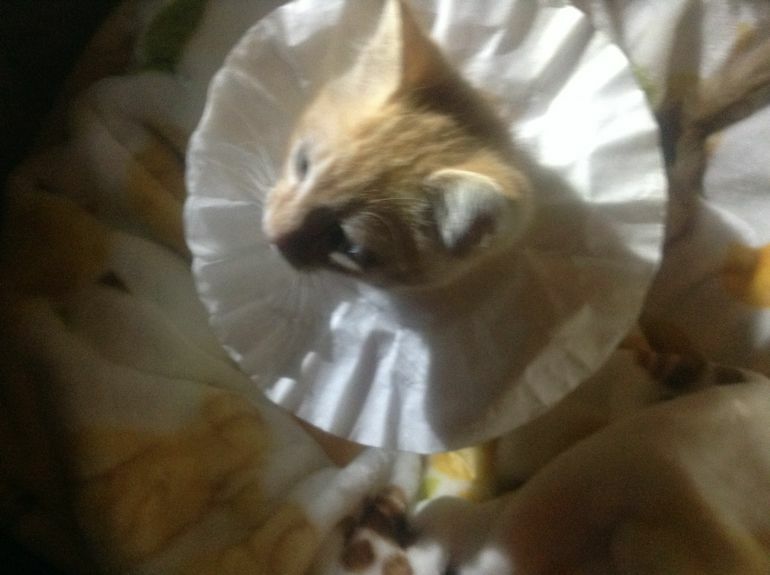 Tiny Simba recuperated with a coffee filter Cone of Shame! For today’s Tripawd Tuesday spotlight, we’re celebrating a love story. Simba’s to be exact. In 2016 this lucky kitty was saved from terrible things when she found him outside, alone, cold and injured, in search of his furever family. 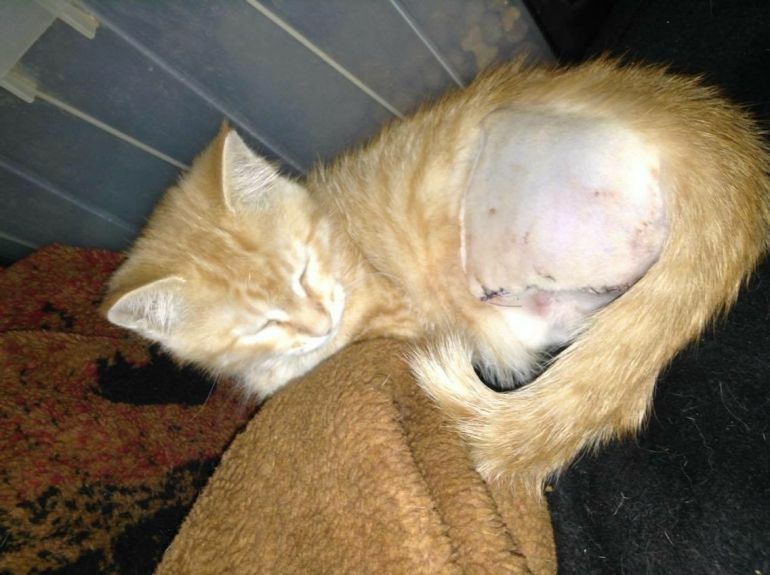 In his short but sweet Tripawds kitty blog, For the Love of Simba, Danae documents his amazing recovery. Trikitty Simba just after amputation. We took him in and Dr. Dixion told us the leg was dead that he would need to amputate the hind leg now! Well we had been told by the vet the main reason why they didn’t wanna do the amputation is that Simba was in bad shape health wise when we found him plus anybody is put at risk with anesthesia and they estimated Simba to be 10 weeks old on he’s 1st visit! 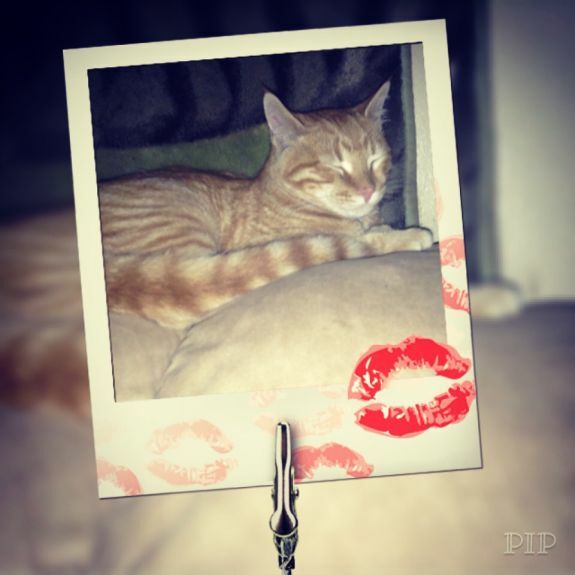 Thanks to all the love and care he received, six months later Simba found his purrfect life! Theo and I were terrified when the vet explained to us that Simba may not make it threw the surgery because he was so little…but without he wold not be here now!! Here is the bottom line in our opinions having Simba in our life for a short time and trying to give him a real shot out life was a blessing then to never have our hearts filled with the love this kitten gives!